Training, learning, and development to equip members of our community to lead change in a complex world. As part of this goal, AU will implement institution-wide training for all community members, tailored to the needs of AU constituencies, designed to focus on cultural competence as a critical aspect of orientation, learning, onboarding, and professional development. A focus on campus climate, culture, and community, so that all community members feel that they belong here. As part of this goal, AU will provide grant incentives to encourage collaboration across departments and student organizations to develop innovative diversity and inclusion programs, build a sense of community, and positively impact climate for faculty, staff, administrators, and students. Changes to our systems, policies, and procedures to promote diversity, inclusion, transparency, and accountability. As part of this goal, AU will adopt consistent hiring committee policies and practices across the university to further equitable outcomes. Access and equity in the way we recruit, hire, train, develop, evaluate, and recognize faculty, staff, and administrators. 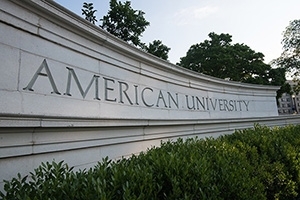 As part of this goal, AU will pilot a training program for faculty hiring, reappointment and promotion review committees focused on recognizing and eliminating bias in recruitment and promotion processes. A focus on curriculum and instruction to ensure that our core curriculum demonstrates critical inquiry, intellectual engagement, and respectful discourse. As part of this goal, AU will require each school to participate in professional development and learning programs to enhance classroom climate. Evidence of successful completion of training or coursework by members of the AU community. President Sylvia M. Burwell announces American University's Plan for Inclusive Excellence and discusses the opportunities and challenges the university faces with respect to diversity, equity, and inclusion.